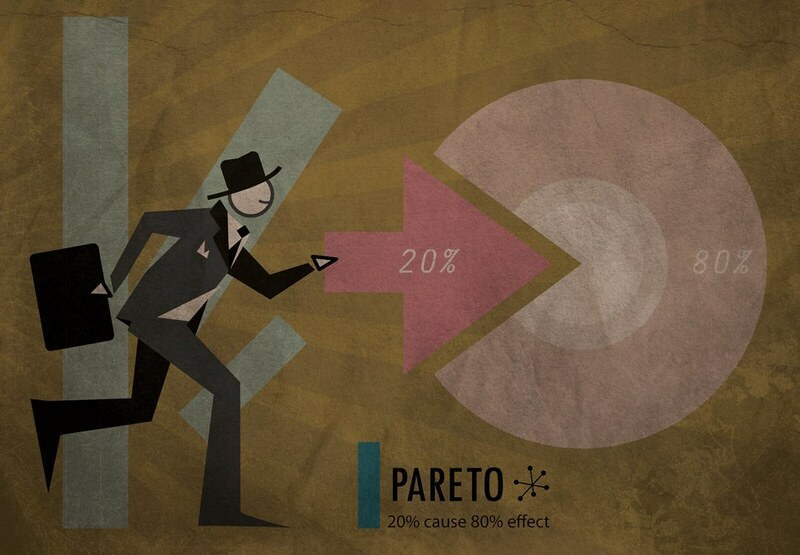 The Pareto Principle, also known as “The 80-20 rule”, states that in many situations, 80% of the effects originate from 20% of the causes. This rule has been applied to economics, criminology, software programming, and business. And now, you’re about to see how it applies to project management. As project managers, we’re always looking for the fastest and most efficient ways to get projects out the door. We use Gantt charts, flowcharts, and other planning methods to be able to speed through all the dependencies and tasks in order to reach a viable product as soon as possible. While the ratio is not always 80-20, there is a set of core tasks that generate a disproportionate amount of work and are essential to project success. These tasks are called “the critical path”, and this is where you should be focusing most of your energy. Take a look at your project plan and determine which tasks make up your critical path—tasks that define your project’s success. Focus your efforts on the critical path and see how that affects the rest of the project. Errors and issues are subject to the Pareto Principle as well. When doing risk management and problem solving, chances are good that 80% of your problems will be coming from a few key issues—whether it’s a bad line of code, a problematic vendor, or bad quality materials. Identify your problems, then identify their sources. Spend your energy working on the causes that have the biggest or most effects. But keep in mind that it may not involve a quick fix. They could be causing the bulk of the problems because they are the hardest and most complex issues to solve. If you look at your daily work schedule, you’ll probably notice that there is a certain segment of the day where you’re most productive—your “power hours” so to speak. These may not be consistently the same time, but they will be nearly the same total amount. The rest of the day is probably spent in meetings, off-site, or doing tasks that don’t push the project forward. Identify your peak period and treasure it. Protect it. Block it off and don’t let anyone short of your CEO (and maybe even him) trespass on it. Then, once it’s consistently followed and observed (both by yourself and everyone in the office), work on expanding it to cover more of your day.